Boat Roller Ramp | Boat Ramp Accessories for 1000# Cap. | VE-VE Inc.
BRA-10-4; 4' Boat Ramp Aluminum "Extra Section"
The BRA-10-4; is a 4 long Aluminum "Extra Section; for both the DDA-1017 ; DDA-1000 Boat Ramps. 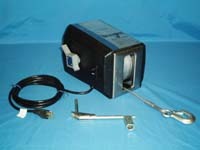 ( Comes with section connecter plates ; "fasteners" not shown. BRA-10; 8' Boat Ramp Aluminum "Extra Section"
The BR-58; "Installation Wheels Kit" consist of 2 (24" Dia.) wheels, 1 Axle, 2 Axle Mt. Brkt's. and all mounting hardware. Kit mounts to the side tubes and allows for easy Ramp installation and removal ( NOTE: Wheels MUST be removed from axel after installation & NOT USED to support Boat Ramp with boat on it !! ). NOTE: For 40" wide Boat Ramps ONLY!. The BR-58 is shown mounted on a Boat Ramp. BRA-10-SS; "Starter Section". 8' Section that has 3ea. Cross Tubes. 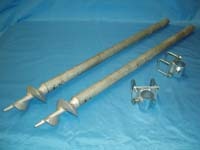 Each Cross Tube has a Keel Roller and 1 pair of Wobble Roller Assemblies. 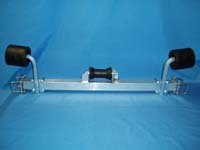 Use with 1 or more BRA-10; 8' Extra Section to make a 1000# Boat Roller Ramp system with out a Winch Section. NOTE: Picture shown is standard BRA-10. 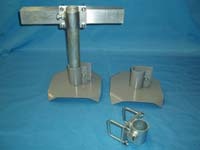 The BRA-10-SS would have the additional cross tube w/ keel roller and 2 ea. 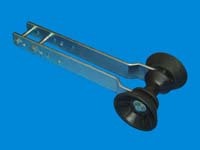 wobble roller assemblies that would complete the end of section. BRA-40; Boat Ramp "Cross Tube Assembly"
Aluminum "Cross Tube Assembly" with keel roller, wobble rollers and mounting fasteners for DDA-1017 & DDA-1000. "Wobble Roller Assembly" is: 1pr. 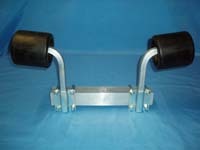 Wobble Rollers with mounting Brkts. and fasteners for all 40" wide, 1000# boat ramp models. NOTE: Parts mounted on aluminum display tube.